Every year in the Faeroe Islands (part of Denmark, a European Union country) hundreds of the intelligent Calderon dolphins (long-finned pilot whales) are slaughtered brutally. The hunts are non-commercial and anyone in the island communities can join in this cruelty at will. When a school of these small whales is spotted close to shore, gloating messengers inform local inhabitants to participate in this so-called ‘heroic’ practice. The hunters first surround the innocent pilot whales with a wide semicircle of boats. The boats then drive the helpless pilot whales slowly into a bay nearby a village, where macho-men stand waiting in the shallow water to slash them with long knives. The poor dolphins are stabbed a number of times and hauled onto the beach with hooks, where they bleed to death. The bay turns bloody red for the amusement of the villagers who have flocked together as silly sheep. It is generally only Faroese men who take part in the killings, while female islanders watch and let these disturbing mass hunts happen before the eyes of their kids. It is necessary to mention that the Calderon Dolphin, like all other world wide dolphin species, is in danger of extinction. Many animals and plants are wiped away from this earth by the ever-increasing numbers of one species: human being. These whale hunts have caused international outrage and have been roundly condemned as unnecessary and barbaric by conservation and animal rights groups around the world. Most Faroese defend their barbarian actions by arguing that the kill (called "grindadráp" in Faroese) is an important part of their culture / history, and they use the meat for internal food distribution among households. But even the chief medical officers of the Faerøer have recommended that pilot whales should no longer be considered fit for human consumption because of the levels of chemical toxins in the whales. 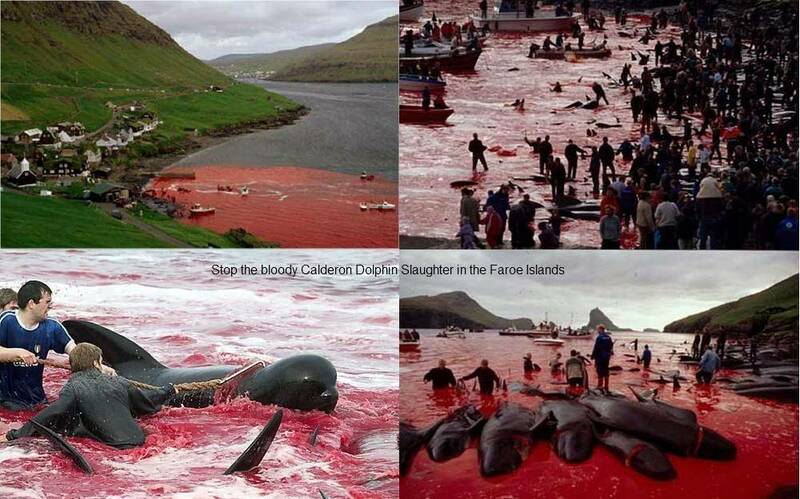 Stop the brutal Calderon Dolphin Slaughter in the Faroe Islands!